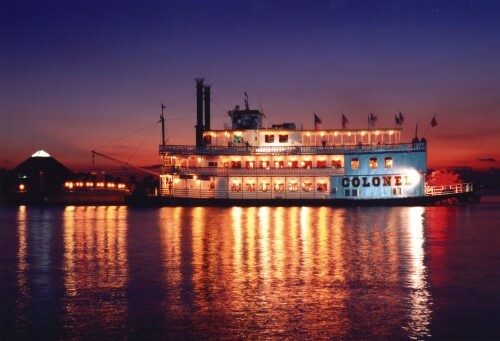 From adventuring in the Rainforest Pyramid to the taking a sunset cruise on The Colonel Paddlewheel Boat, there is something for you to make this Valentine’s Day memorable for those that you love. On February 13 you can make plans with your sweetheart to set sail on a romantic sunset dinner cruise complete with a dinner buffet, DJ, and dancing. This cruise package includes your choice of a bottle of champagne or wine, a rose for your sweetheart, and a souvenir photo. Get a table for two for $200 or a table for four for $380. Seating is limited and reservations are required so be sure to make your reservations now by calling 1-800-582-4673 ext. 4368. For more details and table options, visit our website. We also have our popular Aquarium Valentine’s Day Dinner on February 14. Dive into an underwater dining experience at the Moody Gardens Aquarium Pyramid. The evening includes a chef’s three-course dinner, your choice of a bottle of champagne or wine, a rose for your sweetheart, a souvenir photo, and Aquarium Pyramid admission with our biologists on hand to answer your questions about the Moody Gardens marine animals. Enjoy your romantic dinner while sharks and other beautiful sea creatures swim overhead. There is also the Sealed With A Kiss seating area that treats guests to a table by the seals and sea lions of the North Pacific Exhibit. These playful animals will add a splash of fun to your dining experience. Another option for you and your sweetheart are our Fishin’ For Love tables that have the colorful fish inhabitants provide the perfect backdrop for your romantic evening. The Tunnel of Love section is already sold out. Grab a peak at the seating chart here and make your reservations by calling 1-800-582-4673 ext. 4368. Love is in the air in the animal kingdom, too! For $29.95 you can join us on February 13 or 14 and see the plants and animals you love as you travel around the world in the Rainforest and Aquarium Pyramids with our Rainforest and Aquarium Combo ticket. Visit the seals, sharks, birds, and even Moody Gardens’ sweet new couple, our Cotton-top Tamarins Victor and Gracie. This is a great option if you are looking to involve the whole family in a Valentine’s Day activity. For the entire month of February you can also enjoy the Moody Gardens Hotel Valentine’s Room Special. Be sure to book early because this deal is subject to hotel availability. The price is $229 for hotel room, chocolate covered strawberries and champagne, breakfast, and valet service. You can also enjoy a wonderful Valentine’s Day meal at Shearn’s Seafood and Prime Steaks located in the Moody Gardens Hotel. The menu for the mouthwatering and carefully selected meal can be found here. Finding Mr. or Mrs. Right in today’s day and age isn’t an easy task. With the success of the Internet, dating apps such as Tinder and Bumble have taken the place of matchmaking services for purposes of convenience. 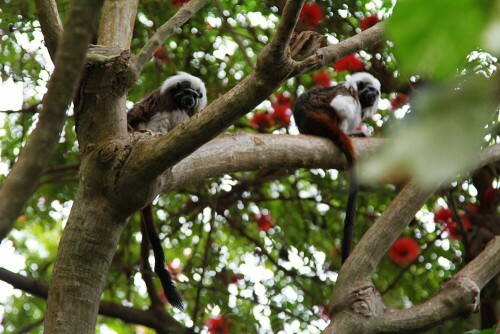 The skilled biologists at Moody Gardens have recently added matchmaker to their resumes as they successfully paired up and introduced two fuzzy Cotton-top Tamarins in the Rainforest Pyramid. This is a difficult feat as this process requires information to be sorted through an extensive database to find the ideal match. Both Victor and Gracie immediately took a liking to one another; so much so that he sweetly observed and presented his new lady’s favorite flower to her. Gracie willingly accepted the gift as her afternoon snack. The Moody Gardens curatorial staff is very hopeful that the two will breed in the future. Tamarins thrive on companionship and usually live in large groups, with sometimes as many as fifteen members. Typically, female Tamarins give birth to non-identical twins and the father will take part in caring for the infant by carrying it on its back. Infant Tamarins are about 15-20% of the weight of an adult Tamarin so it will certainly be an endearing sight to see as you can imagine! Native to the South American country of Colombia these petite primates spend most of their time in treetops feasting on fruit, bugs and flowers. Approximately 9 inches in height, they are among the smallest of the primates that are easily identified by their white flowing head of hair. Although small, these primates can produce close to 40 different vocalizations when communicating with family or other fellow Tamarins. The Cotton-top Tamarins reside in the Moody Gardens Rainforest Pyramid. This exhibit is home to various birds, mammals, amphibians and reptiles native to the rainforests around the world. Offering canopy and ground level views this immersive environment gives guests a one-of-a-kind experience. With the weather getting colder and the holidays closer, one of our favorite things to do is watch Christmas movies with our family and friends. At Moody Gardens we bring holiday films to the next level by showing them not only in our 3D theater but our 4D Special FX Theater as well. This year Moody Gardens is thrilled to present The Polar Express in our 4D Special FX Theater which combines 3D projection with audio and timed sensory elements. While watching one of the newer holiday classics guests can feel the wind in their face as the locomotive speeds down the rails and smell hot chocolate when it is served to the excited children aboard. Perhaps the most enchanting part of the experience, however, is the snow that falls inside of the theater at the same time that it falls in the film. The 4D experience engages all the senses and leaves guests wishing that they would wake up to the train outside of their house to bring them to the North Pole. There is no doubt that after the film children and adults alike are left still believing in the Christmas spirit… and hearing the bell! To experience the sensory adventure of The Polar Express in our 4D Special FX Theater guests can purchase tickets in the Visitor Center for $10.95 for adults, $8.95 for children and seniors, and free for children under 3. If you have a day pass or membership the theaters are included for you to enjoy! Happy Birthday, Wagner, the Oldest Chinstrap Penguin in North America! Some people think that age is just a number but at Moody Gardens it is something to celebrate, especially when one of our animals has a milestone birthday! Wagner is one of 15 chinstrap penguins that we have in our Aquarium Pyramid® and she is the oldest of her species in all of North America! Wagner is turning 32 today which is big deal not only because she is the oldest penguin on this continent but because the general lifespan of her species is only in the mid-twenties. While living in our South Atlantic Exhibit Wagner generally enjoys spending her time swimming but on her birthday we planned a little something extra. 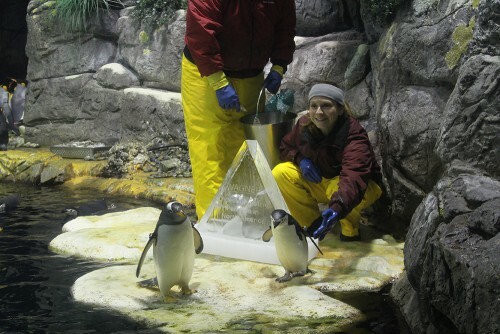 Wagner was presented with a special ice sculpture modeled after the Aquarium Pyramid® that she lives in and she seems to know that it was all about her today. She is typically more aloof. Today, she was frolicking in the water and interacting more and seemed to enjoy her birthday party. The children outside the exhibit also enjoyed her party, as they sang Happy Birthday to Wagner. Please join us in wishing Wagner a very happy 32nd birthday and send her a congratulatory message on being the oldest chinstrap penguin in North America! Also be sure to see Wagner in person before the penguin exhibit temporarily closes from January 11-March 11 as part of the aquarium renovations. (Don’t worry though; the rest of the aquarium exhibits will still be open during this time.) Before the penguins go on hiatus there is still time to come visit our South Atlantic friends! You can get up close to our penguins as part of the Moody Gardens Public Penguin Encounter. The encounter lasts for 45-minutes and allows you to get up close to one of our penguins like Wagner. During your experience you are led by a Moody Gardens biologist from the front of the exhibit to behind the scenes of the penguin food preparation kitchen and then to the back of the chilly penguin exhibit. This is all while discussing penguin biology, conservation, training, enrichment and care with your Moody Gardens biologist. 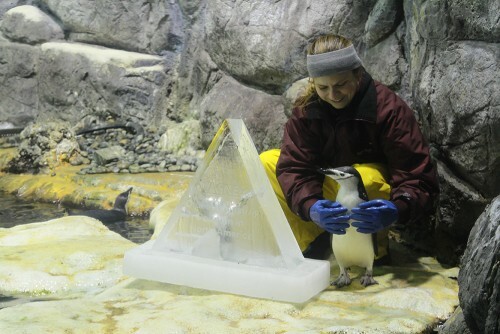 Come experience the cool climate and sounds of the exhibit and witness a penguin create a work of art with a penguin painting as part of an enrichment activity for the animal! More information on the Moody Gardens Public Penguin Encounter can be found here. You can even purchase a penguin painting in our Aquarium Gift Shop. Proceeds from the painting go toward animal conservation projects. It’s a very unique gift for the animal lover in your life! Posted on December 16, 2015 January 25, 2016 Author Moody GardensCategories Animals, Aquarium PyramidTags Animals, Aquarium, chinstrap penguins, Moody Gardens, Ocean, penguin, Penguins, south atlantic1 Comment on Happy Birthday, Wagner, the Oldest Chinstrap Penguin in North America! Coming to Moody Gardens for the holidays is an enchanting experience that offers worlds made of ice, lights, and adventure. Part of the enchantment is due to the collection of pandas, jellyfishes, and cherry blossom tree lanterns that we have along Hope Boulevard. These lanterns are just some of the many that we have in honor of the Chinese Lantern Festival. The connection between the Chinese Lantern Festival and Moody Gardens is rooted in our ice carvers that come to us all the way from Harbin, China. Our skilled and talented ice carvers came to America sharing their cultural with staff and guests alike and we thought it was only fitting to represent them on their property. The Lantern Festival has been part of Chinese New Year celebrations since the Han Dynasty of The Chinese Empire (206 BC- 221 AD). The Chinese Lantern Festival is usually held on the 15th day of the first month of the lunar calendar and marks the end of New Year festivities. The people of the Han Dynasty believed that fire contained mystical properties that would ward off evil and prevent natural disasters as well as bring blessings such as a bountiful harvest to the people. Over the past centuries the lantern festival has evolved and now features lanterns in all shapes and sizes. These modern lanterns come in elaborate sets of vibrant color, dazzling lights and eye-catching design like the ones found on our property. 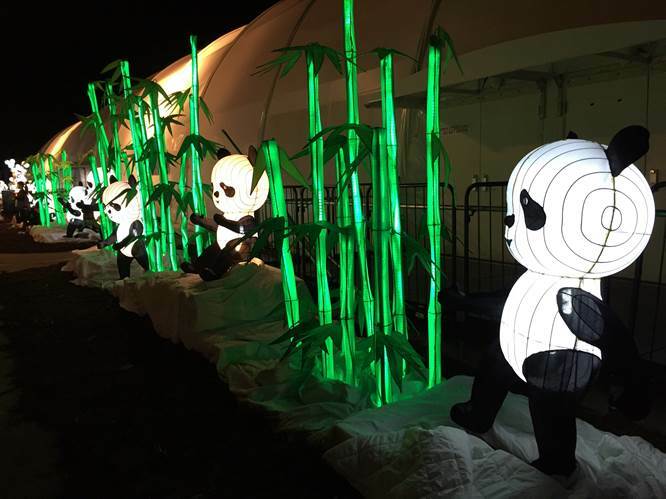 When you come to Festival of Lights be sure to check out this unique cultural aspect that also makes for the perfect backdrop for photos with our playful pandas in a bamboo forest! The Festival of Lights is a mile-long trail of more than 1 million lights. It runs daily until Jan. 10. Admission to the Festival of Lights is $10.95, including ice skating admission. Guests can bring their own skates or skate rental is available for $7 with the purchase of a Festival of Lights ticket. A frosty new addition to the Festival of Lights this year is ICE LAND: Ice Sculptures with SpongeBob SquarePants. Being the only holiday ice exhibition on the Gulf Coast, this vast and magnificent display of 900 tons of ice creations has transformed Moody Gardens into the largest holiday destination in the Southwest. Chilled and held at a temperature of 9 degrees, guests can witness these works of art through January 4. Admission to the exhibition is $26.95 for adults and $21.95 for seniors and children. Bring a little holiday cheer to those in need by participating in Moody Garden’s annual Food Drive Thursdays! 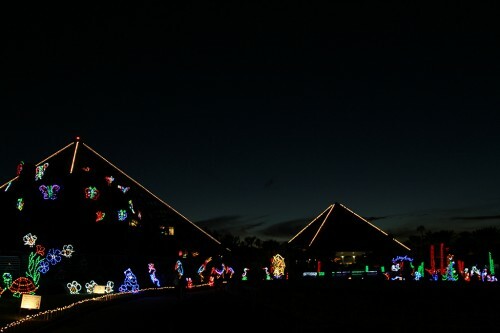 Every Thursday night from 5:00 p.m. – 10:00 p.m. beginning on November 19 – January 7, guests can bring a non-perishable food item and receive a 2 for 1 admission to the Festival of Lights. The food drive program will benefit Galveston County and Houston Food Banks. Now in its 14th year at Moody Gardens, the Festival of Lights is the Gulf Coast’s largest holiday event! The attraction consists of a mile-long walking trail that features over 100 sound-enhanced animated lighting displays. Satisfy your hunger with some of our mouth-watering food stands or take a stop at our gift shop. Admission is $10.95 for adults, children and seniors including ice skating. Guests can bring their own skates or skate rentals are available for just $7. 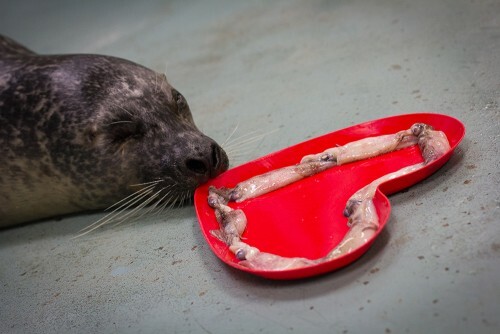 It is with great sadness that we share the news of the death of Presley the Harbor Seal. She died overnight this past week from an Upper Gastric Torsion. This condition can informally be described as the twisting of the stomach that was likely caused by movement or something the animal unknowingly did to itself. As was the case with Presley, it can occur suddenly and without symptoms. At home, some of us may be familiar with the condition as it is fairly common with dogs. Some animals can endure chronic, long-term battles with Gastric Torsion without relief. In Presley case, she had no symptoms and her behavior and appetite were normal throughout the day. Presley was born in 2005 at the Memphis Zoo. In 2006, we opened our doors and hearts to her as the ideal companion for our Harbor Seal named Porter. Porter is a rescue animal found off the coast of Maine and ineligible for release to the wild. Although Porter had Fur Seals and Sea Lions in his North Pacific Exhibit, the addition of Presley provided better companionship from another seal of the same species for a more natural situation. Together, the two Harbor Seals bonded and were active and playful in their exhibit. In 2011, the pair had a seal pup named Riley. Riley currently lives at the Gladys Porter Zoo in Brownsville, Texas. Presley and Porter have been a favorite among guests who have come to visit them at the Aquarium Pyramid for nine years. As the staff mourns the loss of this beautiful animal, we know she will be greatly missed by our guests as well. She will be remembered for her gregarious nature and the joy that she brought to so many of us. Although the Aquarium Pyramid is currently closed for the first phase of renovation, you can watch the seals on our Webcam. You can visit the seals in person when the aquarium temporarily reopens starting November 14, 2015. Most certainly Presley cannot ever be replaced, but biologists will closely monitor Porter’s behavior and well-being as animals grieve the loss of a companion too. They will work with AZA and the National Marine Fisheries Service to identify a suitable companion. Happy birthday, Murphy and Diablo! 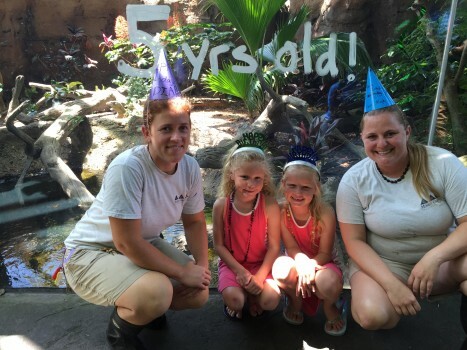 The Komodo Dragons of Moody Gardens celebrated their fifth birthday with quite the party. Murphy and Diablo, Galveston’s only Komodo Dragons, were surprised with a lizard style birthday cake containing some of their favorite treats including eggs and meat. The crowd gathered around as the zoo keeper team fed them their delicious birthday treat. The dragons also received handmade cards and birthday decorations to enjoy on their special day. Among the crowd, were two particular guests that had something very special in mind for the dragons. 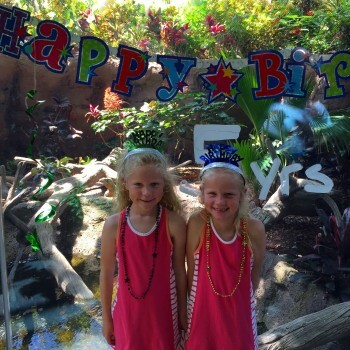 Twins Izzy and Abby have celebrated every birthday with the dragons and visit them frequently. Every year, they bring cards and sing “Happy Birthday,” but this year, they decided to adopt a Komodo dragon from the World Wildlife Fund on behalf of Murphy and Diablo. “This is such a warm and inspirational happening, one that touches us all here in the Rainforest Pyramid,” said T’Noya Gonzales, Asst. Behavior Management Coordinator. The Komodo Dragon is the largest lizard species in the world with potential of reaching 10 feet in length and weighing over 150 pounds. Despite their size, these guys are known for their burst of speed. They can briefly reach speeds up to 13 mph. While the dragons have already had their cake, the celebration will continue. Be sure to stop by and wish them a Happy Birthday! Posted on August 20, 2015 August 20, 2015 Author Moody GardensCategories Animals, Rainforest PyramidTags Animal Birthday, Komodo Dragons, Komodos, Moody Gardens, Rainforest, Rainforest PyramidLeave a comment on Happy birthday, Murphy and Diablo! Always among the leaders in use of state-of-the-art technology, Moody Gardens is showcasing another first in entertainment with the opening of its new attraction, the SpongeBob SubPants Adventure. Moody Gardens has partnered with Nickelodeon, Super 78 and SimEx-Iwerks Entertainment to create this innovative attraction opening in the Discovery Pyramid on May 23. Harnessing the power of modern computer technology and classic artistic techniques, a group of designers, engineers, fabricators and animators who are responsible for many of the world’s leading theme park attractions have come together to create the SpongeBob SubPants Adventure. Guests will experience a whole new kind of submarine adventure as they take the “Le Plunger” into the hyper-real, life-sized world of Bikini Bottom which is viewed through a 30-foot wide observation window. Patrick Star and the rest of his animated underwater pals are seen on screen through 3D technology, as guests are able to have real-time conversations with him and help choose their path through the underwater adventure. To further immerse guests, four large viewing portholes bring the experience of the entire submarine to life. To make this all possible, Super 78, an attraction design and production company, has provided their newest custom software and hardware for the SpongeBob SubPants Adventure named the Gepettoo™. This Animation Control System allows a performer behind the scenes to control all aspects of the full-sensory experience on screen in front of audiences. The performer’s voice becomes an on-screen character, and he has an unlimited palette of animation options which brings the character to life. The performer also runs the lights, sounds, bubbles, and scents with the push of a button. SimEx-Iwerks Entertainment created custom seats, designed and installed all theater systems and programmed special effects in new ways to enhance the adventure. They worked closely with Super 78 to integrate the virtual actor system into the overall attraction. “This collaboration creates an emotionally engaging experience with innovative technology and definitely takes 4D storytelling to the next level,” said Mike Frueh, Senior Vice President, Licensing & Distribution at SimEx-Iwerks. Also used in the design of this breakthrough attraction is Mushroom VR™, a proprietary attraction design tool that utilizes the Oculus Rift virtual reality headset to pre-visualize the experience. It provides an accurate guest-experience assessment of all the attraction content, including 3D environments, media, scenic and show elements, making it seem as if you are submerged within Bikini Bottom. 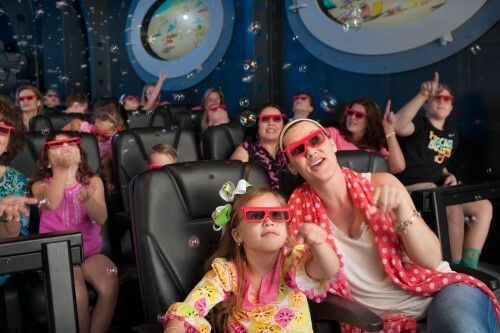 This world-class technology immerses guests in a non-stop whirlwind of surprises with fun for the whole family to enjoy. 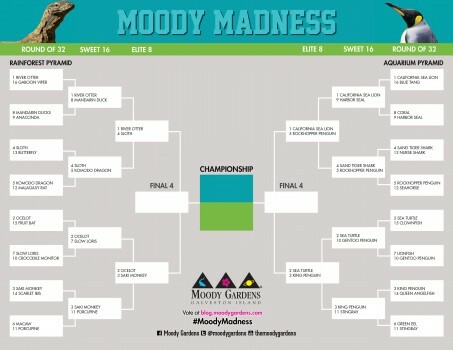 The inaugural Moody Madness tournament produced plenty of drama and upsets last year. In the end, the California Sea Lion was voted by you as the favorite animal at Moody Gardens. Can the Sea Lion repeat as champs? We’re about to find out with the second annual Moody Madness. The most popular animals from the Aquarium and Rainforest Pyramids are squaring off in a bracket-style tournament this week. The animals were seeded based on last year’s results, but that doesn’t mean upsets aren’t possible.